Our 10-pound mutt, Lola Paloma, often accompanies me when I pick up my son from school. I’ll feed her Beneful Healthy Weight and then we’ll hop in the car and go. She looks forward to the car ride, and nothing beats the sonrisa on my son’s face when he climbs into the car and she greets him with sloppy kisses and a wagging tail. On a recent ride home I accidentally left a bag of snacks near where Lola was sitting, and when my son tried to pet her, she snapped at him. There was something about the way he bent over next to the food that ticked her off, and she became territorial. My son escaped with nary a scratch on him, but the experience scared him. I seized the opportunity to remind him about the right way to approach a dog, including our own. “Any dog, even a friendly dog, can bite if provoked or suddenly surprised,” says veterinarian Vijay Sasi of Vets Plus in Menomonie, Wisconsin. Besides knowing when to approach a pup and when to stand back, there are a few more safety tips that all kids should follow. Here are the key rules to teach your kids about dog safety. 1. Don’t disturb dogs that are sleeping or eating. “When pets are in their personal space, it’s best to leave them alone,” says Katy Nelson, veterinary contributor to Pet360.com and host of “The Pet Show with Dr. Katy.” It’s important to teach kids that just like people have personal space, dogs do, too. Lola definitely felt like her personal space was invaded the day she snapped at my son. He got too close to her snacks, which she’ll do almost anything to protect it. This rule also applies to perros that are sleeping, nursing, or otherwise caring for puppies. 2. Allow a dog to see and sniff your hand before petting. This is something I have to constantly remind my son. He’s such a dog lover that he often forgets and has been known to walk right up to a dog, even when he’s never seen it before. Dogs need to be approached gently, so they don’t feel startled or cornered. Sniffing is their way of getting to know you — it’s sort of like the doggie handshake, if you will — so it’s important to stretch out a hand gently and let the dog sniff before actually petting him. 3. Teach kids the proper way to handle dogs. They should pet the dog gently, never pulling or tugging — and they should never pick up a dog unless accompanied by an adult who can help to properly position the dog in their arms, both for the safety of the dog as well as the child, Nelson says. It’s important to teach kids that pulling a dog’s tail or ears, or even pretending to ride a dog, is not appropriate and can prompt the dog to become aggressive. 4. Be respectful of the dog’s toys. Some dogs feel strongly about their balls and chew toys — just like kids do with their favorite toys! The American Kennel Club recommends teaching kids that just as they wouldn’t want someone to grab a favorite toy away from them, they shouldn’t do it to dogs, either, unless the pup has been trained to drop it and hand it over first. 5. Only play with dogs when an adult is nearby. 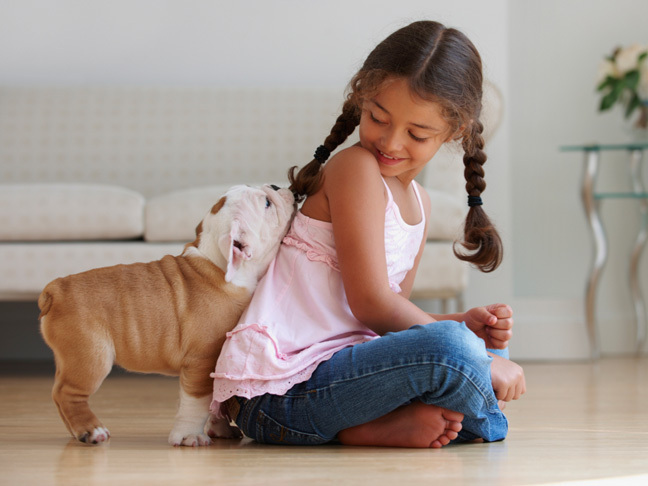 That way, interactions between the dog and child can be monitored, says plastic surgeon Stephen Colbert, M.D., an assistant professor of surgery at the University of Missouri School of Medicine. Dr. Colbert says most of his patients with dog bites are niños. 6. Roll into a ball and lie still if knocked over by a dog. It’s important to cover the head and neck with your arms if you can, and try not to scream. Loud noise and sudden movements will only aggravate an already aggressive dog. 7. Teach kids to quietly, confidently walk away from aggressive dogs. There are approximately 4.5 million Americans who are bitten by dogs each year, and about half of those are children, according to the Centers for Disease Control and Prevention. “If the dog goes after a child, it’s important to ‘be a tree’ and stand quietly, with hands low and clasped and head down,” Nelson says. Avoid escalating the situation by yelling, running, or making sudden movements. 8. Ask before approaching someone else’s dog. Teach your children to always ask permission before they approach someone else’s dog, even if they’ve met before. 9. Never approach unfamiliar dogs, especially when they’re off a leash. If approached by an unfamiliar dog, stay still and avoid direct eye contact, Colbert says.